since recent updates of KDE, I get constant authorisation requests from Google/Gmail. Before it wasn't an issue. I have added the akonadi/kmail to the list of trusted apps in the Google account. 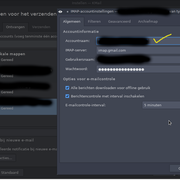 The secure password is correctly updated in Kmail settings. Do you happen to receive the same? It's annoying to see all of sudden 2 to 4 requests in one go to authorise akonadi for an access to my google account data. I changed the username though this happens still. Even if I shutdown/restart, first thing I receive after I login to KDE is the akonadi_imap authentication request. I found what was causing the constant Akonadi login request- it's the which authentication method you use. Choosing GMAIL will cause the "issue". Choosing other methods (maybe less secure) helps.